Police secure the area following a mass shooting at the Henry Pratt Co. in Aurora, Ill., on Friday. 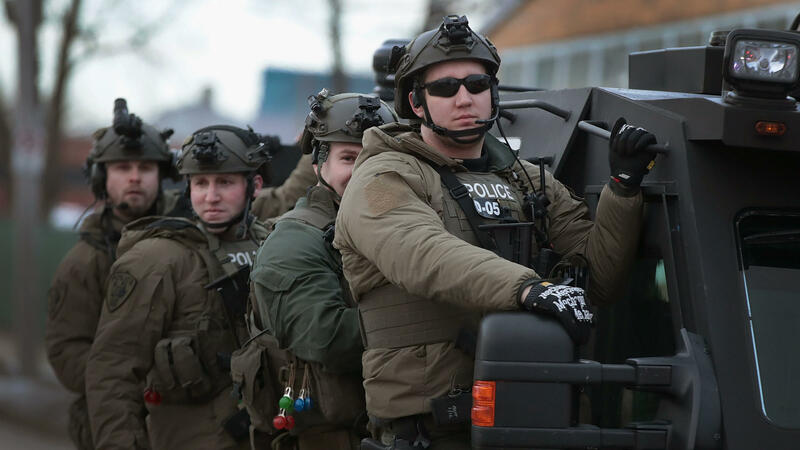 A gunman killed five people and wounded five police officers before being fatally shot by police. Police Chief Kristen Ziman said the gunman, identified as Gary Martin, 45, was killed in a crossfire with officers. She said, in a second late-night news conference, that the gunman was a 15-year veteran of the company who was being terminated Friday. Ziman said she did not have more information on what might have motivated the gunman. Martin is believed to have acted alone, she said. A search of his residence did not turn up more information or other weapons. "At this time, I'm told we didn't find anything," said Ziman. Two of the wounded officers were airlifted to trauma centers in Chicago, Ziman said. A sixth officer suffered a knee injury. Earlier reports said that several civilians were wounded in the incident, but in her second news conference Ziman said there was only one who had been treated for injuries that were not life-threatening. A local hospital reported that three people involved in the shooting were being treated for non-life-threatening injuries. The names of the deceased have not been released while their families are being notified. Ziman said the police department began receiving multiple 911 calls about a shooter at the plant at about 1:24 p.m. local time. Within four minutes, a small group of officers had arrived at the 29,000-sqare-foot building "and were fired upon immediately." The shooter continued to fire on additional officers as they responded to the scene. Meanwhile, other officers set out to locate gunshot victims inside the massive building. 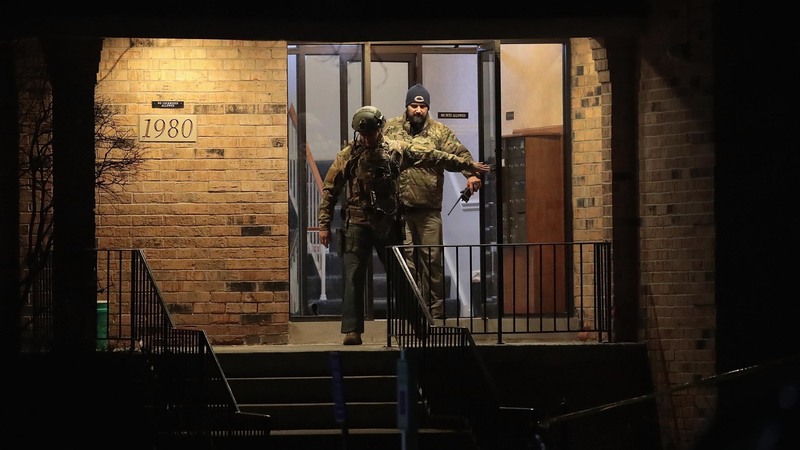 The gunman is believed to have shot his workplace victims before the police arrived and then engaged the first responders in an initial exchange of fire, wounding two officers before he retreated into the massive building to hide. Thirteen teams of responders entered the building to find him. About 90 minutes after the first exchange of fire, police located the gunman inside, and shot and killed him. He carried a Smith and Wesson handgun, Ziman said. 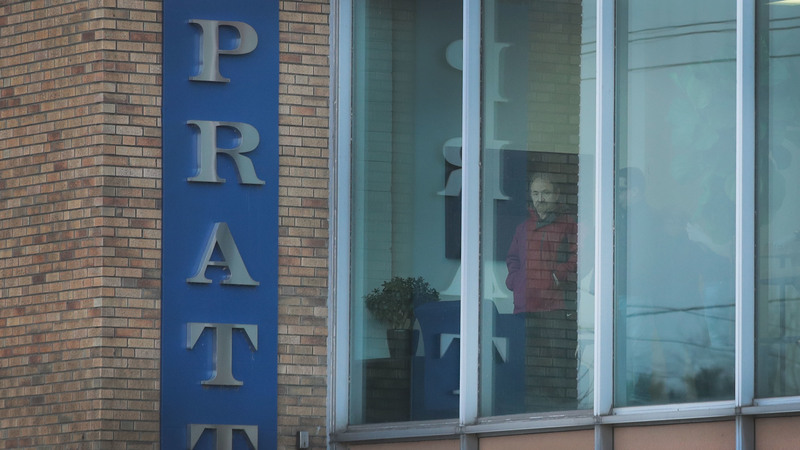 Workers look out an office window following the shooting at the Henry Pratt Co.
Illinois Gov. J.B. Pritzker, who was also at the news conference, mourned the victims killed in Friday's violence — a day after the anniversary of a mass shooting at a high school in Parkland, Fla. "Tomorrow the families of the victims will be less than whole. They join a group that should not exist, and yet continues to grow," Pritzker said. Similarly, Aurora Mayor Richard Irvin commented on the ubiquity of mass shootings in the U.S. "It's a shame that mass shootings such as this have become commonplace in our country," Irvin said. "It's a shame that a cold and heartless offender would be so selfish as to think he has the right to take an innocent life. But we as a society cannot allow these horrific acts to become commonplace." Chris Southwood, president of the state Fraternal Order of Police, offered gratitude for the bravery displayed by Aurora police officers. "Every police officer dreads days like this one," he wrote in an emailed statement. "Yet these ... courageous Aurora officers and their colleagues did not hesitate to literally put their lives on the line today to stop further bloodshed." Police searched Gary Martin's home for evidence related to the shootings Friday. The police chief said nothing relevant was discovered. "These ... heroes willingly ran into harm's way to protect their fellow citizens and very nearly paid the ultimate price. We Illinoisans should be humbly grateful for their sacrifice, and we ask that you join us in praying that the injured civilians and police officers make a full and speedy recovery," he added. John Probst, who said he is an employee at Henry Pratt, told ABC7 Chicago "that a man who worked there 'went ballistic' and was armed with a pistol." Probst said he ran from the building after hearing shots and seeing at least one person bleeding. This is a developing story. Some things that get reported by the media may later turn out to be wrong. We will focus on reports from police officials and other authorities, credible news outlets and reporters who are at the scene. We will update as the situation develops.